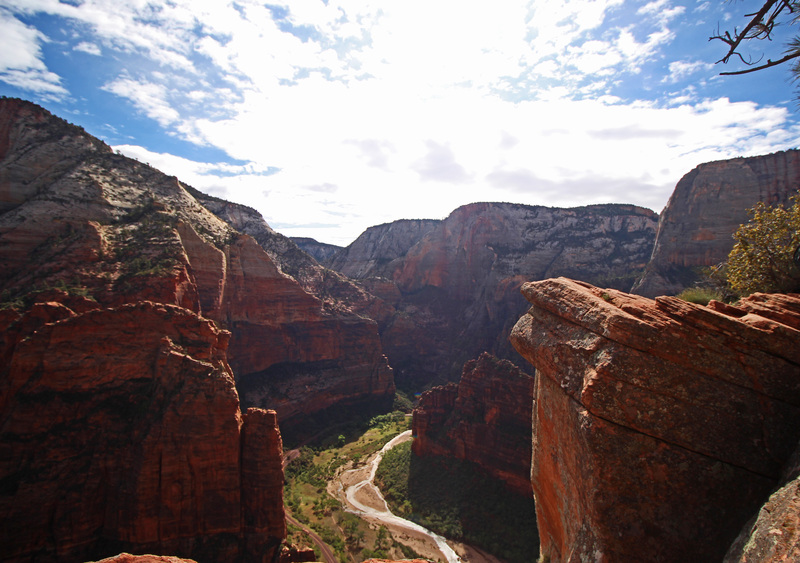 I can’t say that I claim expertise status on this one, but I did recently hike in Zion National Park to the top of Angel’s Landing, which has had its share of deaths, so perhaps I can at least make the case for a little experience instead. When I was younger, I often didn’t recognize experiences as the opportunities for learning that they were. And are. Now it seems, whenever I’m in the middle of something that I haven’t done before, and possibly even some things that I’ve done repeatedly, I try to consider what I can take away from it. Is that maybe a sign of semi-maturity?!?!? Likewise, I think I’m much more open to hearing/seeing/acknowledging God’s presence and direction now too. I think I’ve learned (hopefully) that it’s wise to prepare ahead and pay attention to directions before you go on a journey. For instance, when going on a hike, it’s a good idea to know where you’re going, how you’re going to get there, and how you’re going to get back. This is just plain ole, good Boy Scout training. 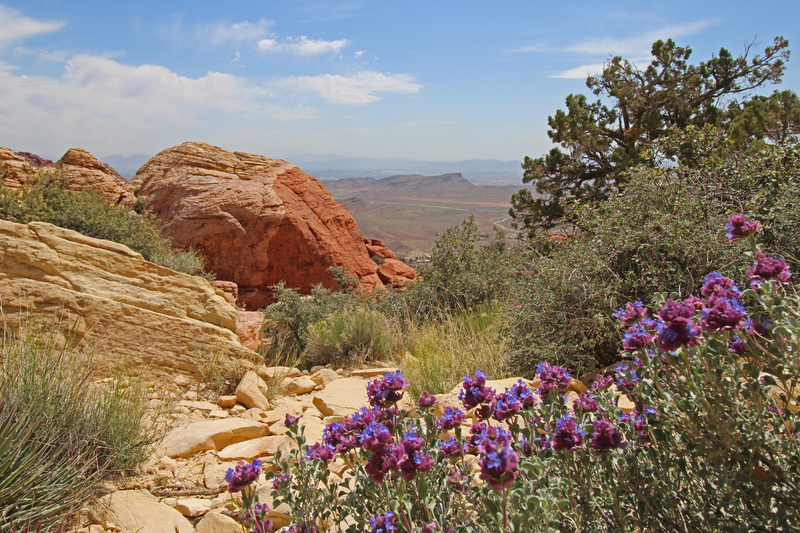 Before we went to Zion, we were in Las Vegas, and the wife of my husband’s business colleague and I went on a hike in Red Rock Canyon, just outside the city. Although we had a park map, and the ranger had given us directions, a lot of the trail wasn’t marked after a certain point. Generally, I have a good sense of direction, but we – I – often felt as if we might not be on the actual trail itself. Having seen many reports of lost hikers over the years, I finally understood how easy it is to become one; right looked left, forward looked backward, up looked up and down looked up. At some places along the trail, it seemed as if there were multiple paths leading away from where we stood. It was all so dusty and rocky and the paths so narrow that it was hard to differentiate what was the designated trail, and what were merely shortcuts. At one point, alone in really, wilderness, we heard a voice above us. We shouted out to it, asking for the way forward. (It felt vaguely like we were having a spiritual moment and “the voice” was that of an angel, which, in a way, it was..) She shouted her reply to “go through the rocks to the right.” We did, and we eventually ended up on the trail again. Somewhere along the trail we noticed rock pyramids, or cairns, laid out at intersections, indicating the appropriate direction to take. Those made all the difference! If only I had known before I would have been looking for them the entire time. Plainly though, I thought I knew more, and felt more capable than I genuinely was. Lesson learned. In the same way, I don’t always pay attention to the markers that God’s set out for me to follow His path. Whether it’s a conversation with my husband, a friend, a Bible verse or passage I’ve read in a book, He’s always leaving signposts to guide me. But sometimes I can’t see the forest for the trees. I have to actively practice paying attention, otherwise I’m likely to lose my way. James 1:12 reminds us that “Blessed is the man who remains steadfast under trial, for when he has stood the test he will receive the crown of life, which God has promised to those who love him.” To get to the top of the mountain, I had to persevere and remain steadfast in my pursuit forward. It was a strenuous climb, to put it mildly, but at the peak, I was rewarded with such an incredible view. Don’t you anticipate that for all the struggles and hardships you face today, your someday – the day your eternity begins – will usher in glory upon glory upon glory? I do, but not without many, many bumps, bruises and heartaches along the way. Looking a little closer, these are people walking the trail up the rocky side of the mountain! But about falling off a mountain and that whole not dying thing? Well, it’s a thing… Never mind that hundreds of people do it on a daily basis, there’s the potential, with one wrong step, one wrong foothold or handhold, and it’s Sayonara, baby. I’m not afraid of heights at all, but I had a couple moments where I questioned my sanity. The mountain is made of sandstone, and near the top on the very narrow ridge, well, the mountain was wearing away and it was… sandy. Kind of slippery, actually. At times when I was trying to find a foothold in a flat-ish part of rock, the sandiness would often cause my shoes to slip a bit. Granted, my foot probably only slipped an inch or two, but when there’s a 1000+ foot sheer dropoff inches away from where your foot is, well, an inch can feel like a lot. 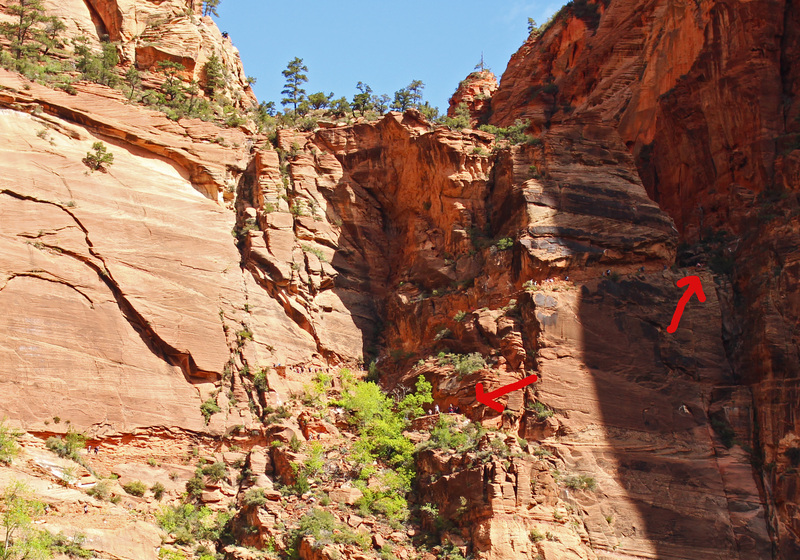 One of the worst aspects of getting to the top of Angel’s Landing is having to share the same narrow ledge with someone going the opposite direction. Even though I went early in the morning, there were enough people coming back down as I was going up and more than enough summiting as I was heading back down. There were chains strategically placed so hikers have a handhold, but again…. 1000 foot dropoff! 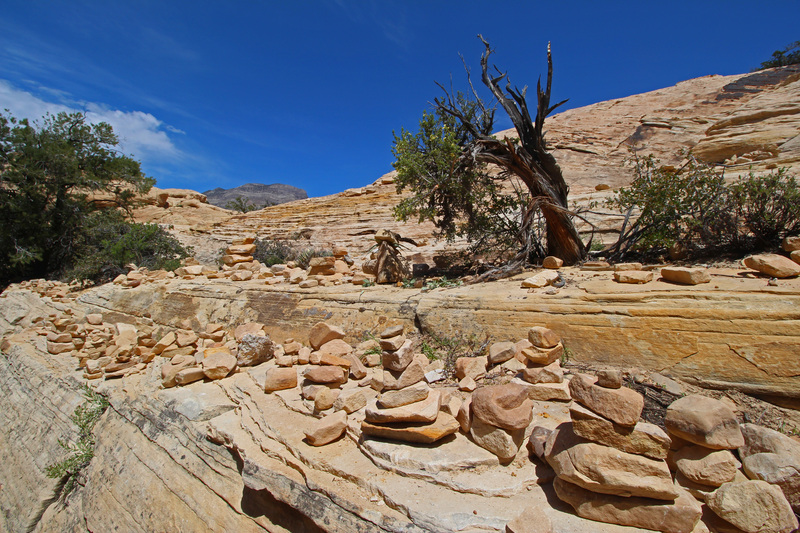 In some places, the path is only 18″ or so wide, slippery with sand, oh, and that 1000+ foot dropoff ever-present, so it can be a bit daunting trying to share that same steep 18″ piece of land with 5 or so strangers. You have to pay attention to what you’re doing. Where you’re putting each foot, grasping each section of chain. Not just for your life, but for the lives of everyone else around you as well. I’m making it sound worse than it honestly was, but again, people have died doing it, so you can’t just throw caution to the wind. It’s a good idea to know where you’re going, how you’re going to get there, and how you’re going to get back. This hike didn’t just happen on a whim. Previously, we had looked at several hiking sites about this trail, gathering facts and tips and strategies to get to the top. Safely. I prepared as best as I could ahead of time, but I also knew that adjustments would need to be made during the hike. I lugged my camera on my back, but even though I made it to the top, it was too crowded to take pictures at the peak, or really even the last half mile. I wanted those pictures – badly – but my life was more important than a trophy picture. I want to step out in faith, sure of my footfall, prepared and assured that God will help me safely summit the mountain, where His glory was, is, and will be. Wow! This was so good. I am in a bit of a hurry, but I could not stop reading till the final word! Your story reminds me of our family trip to Grand Canyon and Sedona. I am afraid of heights, and some of your descriptions left me feeling breathless just thinking about being so high and on a narrow path. I’m also at that point in my life where I see God’s hand and His higher purposes in my experiences. It is comforting to know that He is in control, even when I face those unexpected adventures within my planned day. “I want to step out in faith, sure of my footfall, prepared and assured that God will help me safely summit the mountain, where His glory was, is, and will be.” Yes. That resonates with me. Thanks for this. Thank you Cheryl, for your very kind words. It really is a continual “renewing of my mind” to TRY to think this way. It’s not always my default, but surely, knowing the goal and working toward it has to count for something, right? 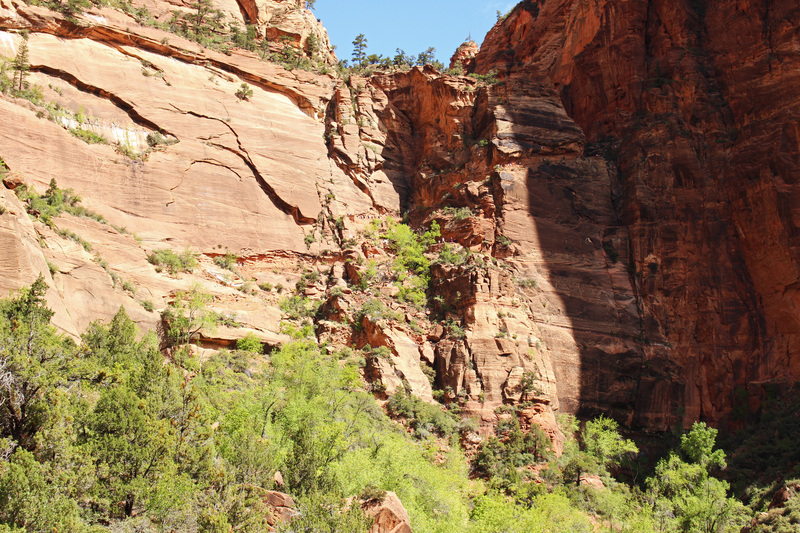 I would love to go back to the Grand Canyon and spend more time there, as well as see Sedona. Maybe because it’s so different from what I’m used to, but I am always in awe of these beautiful areas out West; I’d be happy to spend a month just seeing more of it. Have a terrific week ahead! Being one who is basically a scaredy-cat of heights, water, and a few other things, I admire your courage to do such adventures. I think I’m more sure-footed in my spiritual life than in mountain climbing. Or at least I hope so! 🙂 A great post. Thanks for sharing your journey. 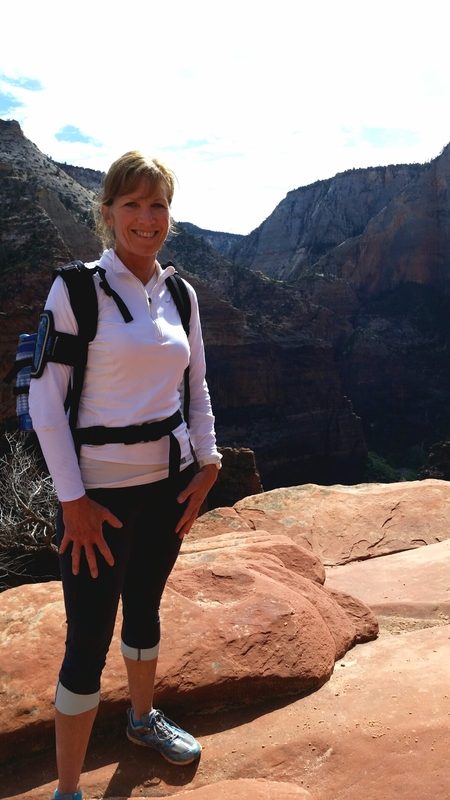 Linda – I wish I were often more sure of spiritual footing than physical… Somehow though, I find that stepping out in faith physically translates to making that mental leap emotionally and spiritually, so I constantly try to push myself for more of both! You made me realize that through your comment, so thank YOU!